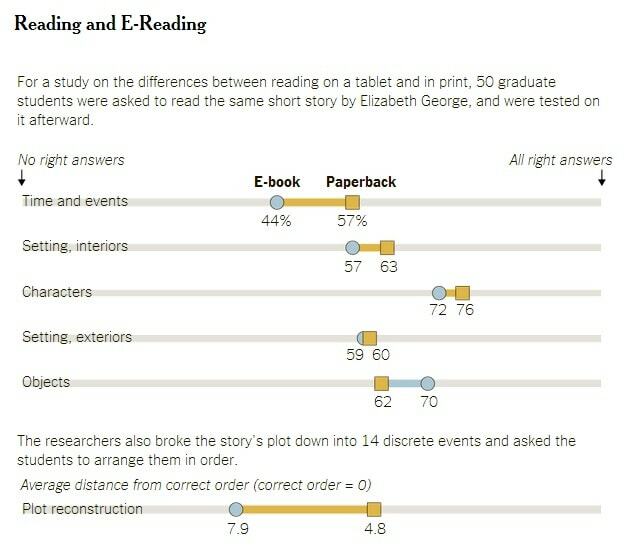 The Guardian reported yesterday on a new study which showed that reading on a Kindle led test subjects to recall fewer details from the story, leading some to speculate that we've reached the edges of ebook usability. While Nicholas Carr might want to use this paper to sound the death knell of ebooks, I think further study is warranted. The Guardian only briefly mentions the rest of the study, where the Kindle group tested about the same as the control group. As you can see, in most categories there wasn't a huge difference between the two test groups. The one exception is time and events, which is quite similar to plot reconstruction. So does this mean that there are limits to reading comprehension on ereaders and tablets? Maybe, but maybe not. For one thing, this study included only two experienced Kindle users, and as you can imagine that might skew the results. Luckily that's not the only study on the topic. I've been following this question for a few years now, and while it is clear that enhanced ebooks don't enhance education that is certainly no reason to throw out the baby with the bath water. I also know of a 2012 paper which showed that test subjects who read on a Nook scored slightly higher on reading comprehension tests. Like the latest study that older research was based on a small group of test subjects, so it's not possibly to use one to refute the other, but it does suggest that further study is warranted. All in all, I would say that it is too early to draw a conclusion either way. Readers unaccustomed to a digital ereader not performing as well on a test? It’s just amazing that a reader who is paying greater attention to how to turn the next page instead of focusing on the story would perform worse on a reading comprehension test, isn’t it? This study has no value. Yes. I noticed that, but forgot to include it. Hmm, I wonder if that will bias the results? I strongly believe that if an honest test is conducted, there will be little or no statistical difference between efficacy of paper or digital. IMHO. Did the Kindle users ever use a kindle before? There is a difference between using a reading device (book) with multi-year practice and a never used before device (Kindle). Page turns on a ereader become with use become just as unnoticeable as they are in a book but it does take some time. I suspect the principle flaw in the study is that they restricted it to Kindles. As the DR article above suggests, people using a nook got a different result; use a Kobo Aura HD with the pages configured to to same standard as the pages of the paper book, with adequate margins, line spacing, the reader’s preferred font and preferred font size, etc., and you would start to find out something about using eInk readers. This study as presented does nothing more than criticize the limitations of Amazon’s flagship offering. I wonder if a site named digital reader might be biased? Hmm? Ya think?